When this card is sent from the field to the Graveyard, each player selects 1 Level 3 or lower Normal Monster from his/her Deck, and adds it to his/her hand after showing it to the opponent. The Deck are then shuffled. Welcome to MY AST week. Last week, we covered the things that had to deal with The Sanctuary in the Sky, the focal Field Spell of the set. This time, we cover the things you will actually see in tournament play, in one form or another. This is personally my favorite card in the set. The reason isn't its playability in a specific deck type, but a game mechanic that this card can abuse that lets you even up the score with someone OUTSIDE of a Duel. First, how the card can actually help you. It's a Witch, but for both players, and only for Lv. 3 or less non-effect monsters. Can we say Exodia pieces? Usually, your opponent won't be running anything that fits this bill (which is VERY important, and I'll get to later), so for the most part we can assume that you'll be the only player getting the effect. Remember the good old days of Exodia decks having 2x Sangans and 2x Witches? They're back. 1x Sangan, 1x Witch, and 3 of this card (because IT WILL NOT BE RESTRICTED.) So what if this card can't grab the Head? You have your actual Sangan and Witch for that. On the subject of Sangan and Witch, this card can't be Sanganed, but it can be Witched. I don't know why you'd want to...if you're letting Witch die, you should be grabbing a piece. The 1600 is nice though -- it kills everything in a Control-based environment, or at least ties it (T-Virus). They HAVE to be using SOME kind of Beatstick in order to ATK this thing and kill it. Back to the other game mechanic, and why I personally love this card...I noted that your opponent usually won't have a monster in their deck that fits the bill for this guy. What happens when your opponent doesn't have a legal target for a search card in their Deck? You get to look through their Deck to verify they don't have a legal target. Why is this so huge? Ever run into one of those people who refuses to give you their Deck List, because they run an original deck type and don't want everyone copying their Deck? This is your legal answer to that. The better your memory, the greater your chances of copying their deck card for card after this card enables you to look through it. 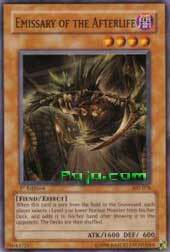 If you're going to run the Exodia deck with this -- BEWARE D. D. Designator! THIS CARD SINKS YOU. Run a couple of Final Countdowns in an Exodia deck if you're going to play Exodia at all; you should be running the prerequisite Gravity Binds and Messenger of Peaces already so getting through 20 turns won't be insanely difficult. Today's card is Emissary of the Afterlife, a Super Rare monster from Ancient Sanctuary. The stats aren't great: 1600 ATK for a Level 4 is nothing to brag about, and 400 DEF, while making him Witchable, won't put up much defense at all if you need to set this. It's DARK/Fiend, so it can help Chaos or Necrofear decks; but those decks do have better cards to use. opponent’s hand is use one of my favorite cards Dimensional Designator. SERPENT in your hand with the quickness! Man, is it good to be back. After tough testing, I'm done with school, waiting for my senior year to start, and now I can finally relax. Whew!! Well, I can say one thing. I know what monsters I'll look for depending on the situation: Sangan, Yata (almost always), Sinister Serpent, and maybe Reaper if I have it in the deck. This card works wonders for a Weenie deck, as most creatures that you would need would be 3 stars or lower. The fact that it's 4 stars kinda downsizes it, though. and 1600 ATK is a good attack for the card. It can get rid of Tribe, a used up Breaker, and could teach Dons/searchers a lesson. Another thing, if you play it in a beatdown of sorts, you could grab an IFL if you got it. Plus, it could help along with all the Weenie support in this set. Mystic Shine Ball is my favorite weenie, but that doesn't matter. Don't know why, but it's kewl (cool). 600 DEF isn't really good as it would falter to most that would attack it. Trample would also have a field day with such a low defense. The fact it has to hit the graveyard also is a setback as DD's would own Em (Short for Emissary). 1600 ATK won't stand up to the beats in the environment right now, like Kycoo, normal 1900 creatures, Slate, etc... The list can go on. Another thing is that it has to be a level 3 or lower creature. No level 4 for you!! Overall, it's a great card for weenies, decent for other decks, but not so good that you should play it in those other decks. I give Emissary of the Afterlife a solid 7/10.